Local Animals in Need of Your Love this Valentines Day! The RSPCA Halifax, Huddersfield, Bradford & District branch are once again calling on the public to choose a lonely heart from their animal centre to send a Valentines card to this February! Fay Gibbons, Events Coordinator, hopes that with support from the community, the branch can have some fun with their February appeal, whilst raising awareness and vital funds, so they can continue to help the many abandoned, abused and neglected animals in the Halifax, Huddersfield and Bradford areas. 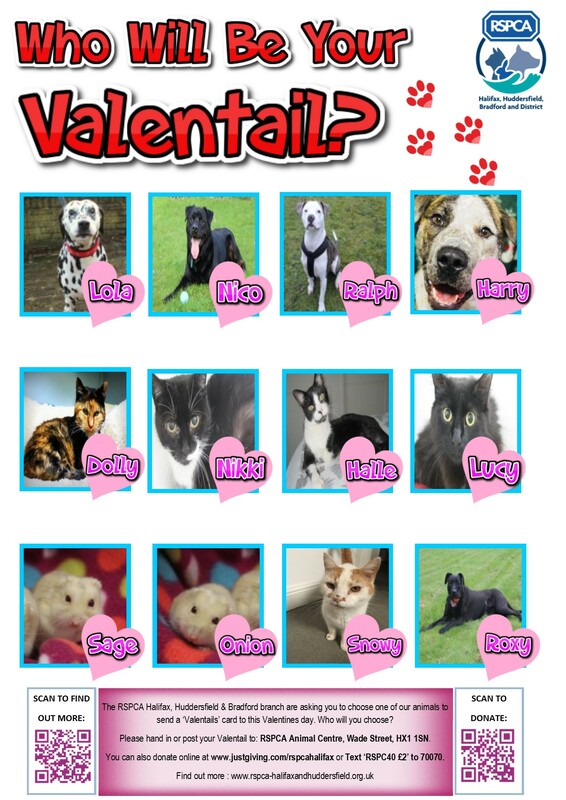 To support the branch’s Valentails appeal all you need to do is visit their website: www.rspca-halifaxandhuddersfield.org.uk and select your chosen animal from the ‘Animals For Adoption’ list. You can then post your card to: RSPCA Halifax & Huddersfield, Wade Street, Halifax, HX1 1SN. If you don’t have time to post a card but still want to show your support you can donate online via the website, Text RSPC40 £2 to 70070 or visit www.justgiving.com/rspcahalifax.